�����In this week's HD Wholesale Market Dealer Price Guide the recent pattern continues with numerous increases for better to rare date coins. Buyers are being very specific in their demands for low pop coins with eye appeal. In many cases this means they want + graded coins or CAC labels. 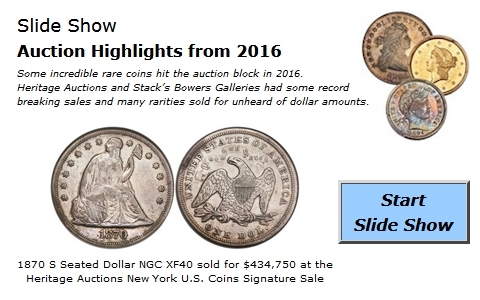 Several of the Carson City Seated Half Dollars advanced this week as a result of recent trades. The 1871 CC in MS64 now has a Market of $79,500 and the 1872 CC in MS63 is up to $43,500. Carson City Seated Dollars also have performed well recently. The 1870 CC in MS64 jumped to $88,500, while the 1873 CC in AU58 moved to a higher $55,500. In addition the 1878 CC Trade Dollar in MS64 increased to $61,500. �����GSA Carson City Morgan Dollars certified by NGC are extremely hot. In past years there may have been just a few dealers who specialize in this area, it now seems like there are well over 25 visible market makers for these highly sought after coins. The MS60 to 64 grades are fairly steady at current levels, but any higher grades seem to be in several dealer programs. The MS66 coins appear to be the hottest because they seem reasonable at current levels, while the MS67 coins are a little pricey according to several dealers. Still, the MS67's are quite rare and the advanced collectors usually don't care too much about price as long as they are competitively priced. �����Dealers are glad the summer is coming to an end because their regular customers will be back from vacations and ready to do some business. The coin market looks solid and metals have been on the rise. Several dealers have reported an increase in sales in the last couple of weeks pointing toward a positive last quarter.